This study has been conducted by Japan International Research Center for Agricultural Sciences. The study is based on Vietnamese government major target species of the country's aquaculture sector. 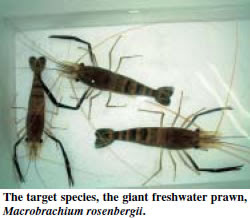 Until the beginning of 2000, the supply of hatchery-reared M. rosenbergii did not meet the growing need for commercial prawn. This problem lead Japan International Research Center for Agricultural Sciences (JIRCAS) and Vietnam's Cantho University initiated a collaborative research in 1995. Their main studies is to jointly developed a new and improved means of seed production technology for this species.